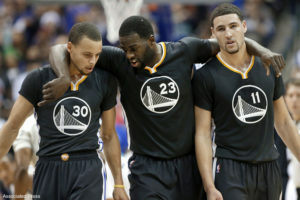 Tonight the Golden State Warriors will face-off against the San Antonio Spurs, well it might as well be the Santa Cruz Warriors that make the trip. That’s because Steve Kerr has decided that Stephen Curry, Klay Thompson, Draymond Green and Andre Iguodala all need to rest tonight, add to that Kevin Durant’s injury and the Warriors are completely punting this game. Steve Kerr cites the crazy schedule the Warriors were dealt as why he is resting the players. Eight games in eight cities over 13 days is crazy, there is no denying that. I’m not sure what the NBA schedule makers were thinking when they made this schedule, but that is an issue for another day. The point is Steve Kerr knew about this schedule all season long. Why not bench one player each game? Now I could get into the whole argument about players back in the day played every game and that players today are soft, but it is not even about that. If a coach feels resting players is best for his team in this new era of analytics, I’m ok with that. The problem is what Steve Kerr is doing is against the spirit of competition. He is intentionally fielding a far less competitive product for no real reason. He could have managed minutes over the previous games. He could have benched the players in shifts. Now all the people in San Antonio that spent their hard earned money to watch what should have been a very competitive, playoff-like game, are getting a D-League showing from the Warriors. Granted, even if the Warriors win with Kawhi Leonard out with a concussion, it doesn’t excuse the action. The NBA needs to regulate this. The NBA needs to state that teams can only sit one, maybe two, players max for rest in each game. More than a quarter of your roster sitting for rest for one game is ridiculous. Granted teams might start faking injuries, but the rule needs to be on the books. It’s not fair to the fans, to competitive balance or to the sport itself. Adam Silver, you need to do something about this.